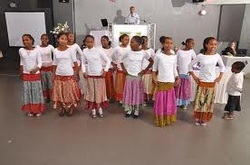 to supply the spiritual and physical (educational, cultural and religious) needs of Ethiopian Jews in Safed and elsewhere. to intervene on behalf, as needed with local and national authorities. home repairs/improvements, buying needed appliances. bar/bat mizvah celebrations, maintenance of the Ethiopian synagogue, expenses for gravestones and memorial ceremonies. Apart from subsidies, the Committee gives interest-free loans. In all cases, the aim is to preserve the recipients’ self-respect so that they see themselves as partners in the activity.